The Forum LP, a gatefold design, unfolded to reveal the full Robert Redding illustration—as illustrated above. Some LPs contained a fold-out poster of the illustration. Missing from the CD are the Steve Schapiro photos which graced the inside fold on the LP (see photo, below). The CD did replicate Mort Goode's liner notes, however. A movement had gathered. Young people and the not-so-young. Common people and the out-of-the-ordinary. Involved people and the deeply-involved. There were $5.50 seats. And $100.00 ones. And such ushers as Warren Beatty, Sally Kellerman, Jack Nicholson, Julie Christie, James Earl Jones, Michelle Gilliam, Goldie Hawn, Gene Hackman, Burt Lancaster, Jon Voight, Cass Elliot, Carly Simon, Peggy Lipton, Robert Vaughn, Bob Reiner, John Philip Law and Britt Eklund. The receipts added up to more than $300,000. It was a beginning. They had put a title on the evening: “Four for McGovern.” Carole King and James Taylor shared the spotlight and the ﬁrst half of the evening’s program. Solos. Duets. Playing. Singing. Raising pleasures. Ovations. Quincy Jones and a 31-piece orchestra with Clydie King and Her Sweet Things had ﬁnished their turn. More cheers. There is more here than Barbra’s individual way with songs. A bow to her son for having found a song for her. Small talk. And serious. Humor. And a program that seems to carry a kind of message of hope and conviction. Look at the titles of the songs. Listen to the lyrics and the emphasis. There are more than mere words. The melody of “Starting Here, Starting Now” was written by David Shire, who conducted this concert for Barbra. The last time he acted as her conductor was during the stage run of Funny Girl at the Winter Garden in New York. The little table was a tea cart. Symbolic? Perhaps. 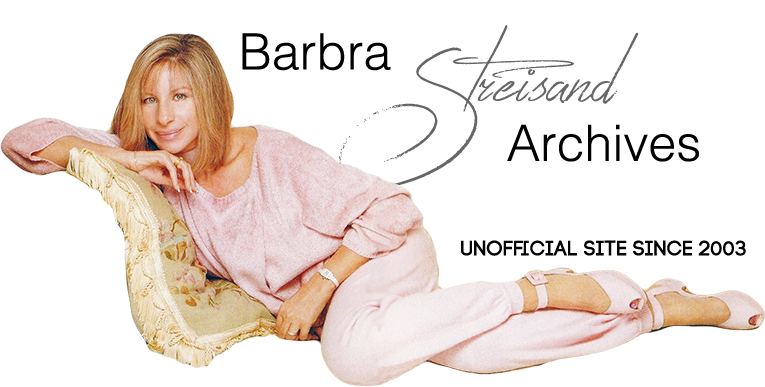 It carried the following elements: a pot of hot tea, cup and saucer, ashtray, a vase with a single red rose, an atomizer, a spoon, cigarette lighter and two other items that can best be described as “souvenirs” of other Streisand performances. “She slowed things down again, becoming the little girl lost, but inevitably, by her voice, turning from fragile to strong. She did ‘Didn’t We,’ then ‘My Man’ from Funny Girl [ﬁlm version], then her rock hit ‘Stoney End,’ looking now and again at forgotten lyrics at her feet,” wrote Rolling Stone. Barbra gave the audience a clear choice between “Second Hand Rose” and “Stoney End.” 18,000 of her fans voted by acclamation. “Both,” they screamed, “both, Barbra.” There wasn’t time. The applause-meter came up for her rock hit. It was a voice vote that raised the roof and the total sense of satisfaction. The people at the Forum that April evening counted up to 18,000—cheering, hoping, sharing. They wanted to be heard. They were standing up to be counted. A movement was gathering. The Forum seemed aptly named and the right place. In Roman days, a forum was an assembly empowered to hear and decide causes. It was an evening of purpose and entertainment. The people had come out that night. The stars of the entertainment world had come out that night. On that night of entertainment “the star” was Barbra. John Arrias remixed the album for CD using the original master recorded by Bill Schnee. The remastered Forum CD was released in 1995. Arrias also segued that track into “Didn't We” seamlessly — on the LP, you had to flip the record over after track 6. The remastering of Forum is incredible. You can hear the difference between the 1989 CD and the 1994 CD almost immediately. Even Barbra's background singers, whose voices almost overpowered hers in “Sing/Make Your Own Kind of Music,” were remixed so that the balance was much more pleasing to the ears. The short piano intro to “My Man,” which appeared on the original mixes of the album, did not make it onto the remaster, however.